A Parliamentary report of 1776-7 recorded a small parish workhouse in Reedham accommodating up to 3 inmates. A House of Industry was erected at Acle in 1788 for a union of seven parishes, with ten other parishes subsequently joining. The building was burned down in November 1834. Norfolk: Acle (3), Beighton, Blofield (3), Bradestone, Brundall, Buckenham-Ferry, Burlingham-St. Andrew, Burlingham-St. Edmund, Burlingham-St. Peter, Cantley, Freethorpe, Great Plumstead, Halvergate (2), Hassingham, Hemblington, Limpenhoe, Lingwood, Little Plumstead, Moulton, Postwick, Ranworth with Panxworth, Reedham (2), South Walsham, Southwood, Strumpshaw, Thorpe next Norwich (3), Tunstall, Upton with Fishley (2), Walsham-South St. Mary, Walsham-South St. Lawrence, Wickhampton, Witton, Woodbastwick. The population falling within the union at the 1831 census had been 9,815 - ranging from Buckenham (population 49) to Blofield itself (692). The average annual poor-rate expenditure for the period 1833-35 had been £5,816 or 12s.10d. per head. 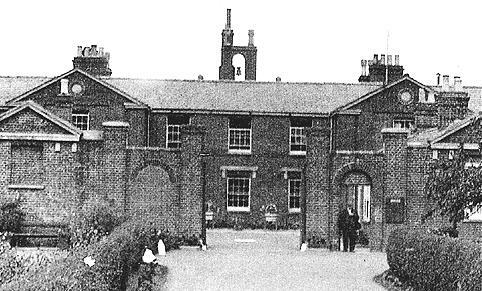 The new workhouse was built 1837 at Lingwood to a design by John Brown the Norfolk county surveyor. The Poor Law Commissioners authorised an expenditure of £5,810 on construction of the building which was to accommodate 250 inmates. Brown designed several other Norfolk workhouses at Docking, Henstead and Yarmouth, as well as ones in Suffolk (Plomesgate, Stow), and Essex (Colchester). Brown's design for Blofield adopted a double-cruciform plan similar to the one at Henstead. Its layout can be seen on the 1880 map below. A separate hospital stood at the north-east of the site. Blofield workhouse entrance from the south. In 1894, the British Medical Journal set up a "commission" to investigate conditions in provincial workhouses and their infirmaries. 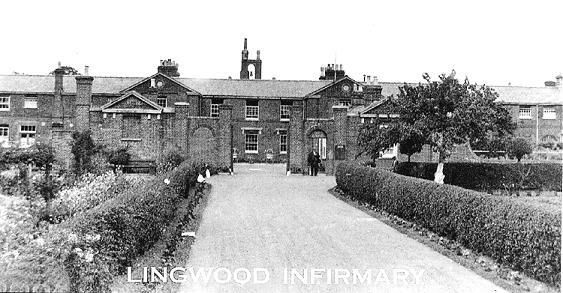 Following a visit to the Blofield establishment, the commission's report noted an inconvenient separation of the female and male infirmaries, with conditions in the latter described as "squalid" and "dreary, comfortless, and crowded". There were no proper baths or running water. The sole nurse was untrained and assisted by a pauper "wardsman" who, at night, provided the only form of nursing attendance. Further details are available in the full report. After 1930, the workhouse became a Public Assistance Institution known as Homelea, housing the elderly, chronic sick, single mothers, children etc. The workhouse buildings have now been demolished. Housing and residential care accommodation now stands on the site. Blofield former workhouse site, 2000. Norfolk Record Office, The Archive Centre, Martineau Lane, Norwich NR1 2DQ. Relatively few records survive - holdings include: Guardians' minute books (1835-1930 with gaps); Ledgers (1837-1930 with gaps); etc. Thanks to Mike Page for the picture of the workhouse.